Trojan-Downloader:OSX/Flashback.A is a variant of the Trojan-Downloader:OSX/Flashback malware that poses as a Flash Player installer, and connects to a remote host to obtain installation configurations and files. 11 April 2012: F-Secure now provides a free removal tool that automates the detection and removal of Flashback variants from an infected machine. Caution: Manual disinfection is a risky process; it is recommended only for advanced users. Otherwise, please seek professional technical assistance. F-Secure customers may also contact our Support. Take note of the result. Delete the file obtained in steps 2. 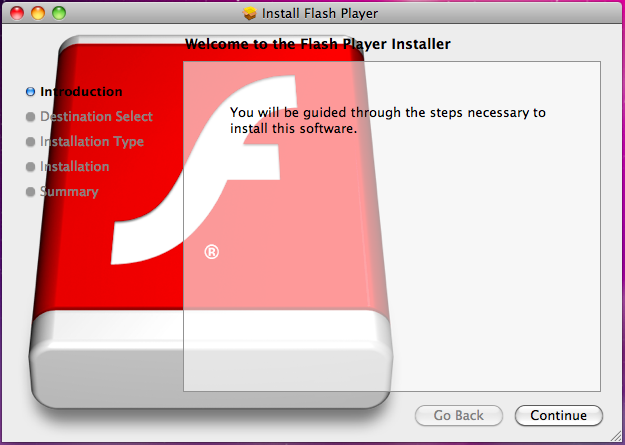 Trojan-Downloader:OSX/Flashback.A poses as a Flash Player installer and connects to a remote host to obtain further installation files and configurations. Little Snitch is a firewall program for Mac OS X. If the program is found in the system, the installer will skip the rest of its routine and proceed to delete itself. Installation files and configuration returned by the host is encrypted using RC4, where the MD5 hash of the Hardware UUID of the infected system is used as the key. The installer contains two payloads. In the first payload, the location, launch point and actual content of the payload depend on the configuration returned by the remote host. The location and actual content of the second payload also depend on the configuration returned by the remote host. This allows the second payload to be loaded when the user runs an application in the infected system. Some samples also restart running instances of Safari and Firefox to take the payload into effect. As of this writing, the remote host has already been taken down. But when it was still active, it delivered only the second payload, which is detected by F-Secure product as Backdoor:OSX/Flashback.A.